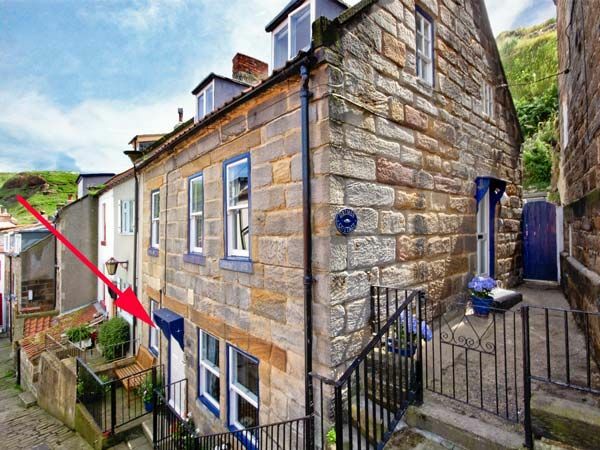 This single-storey apartment sleeps two people in the North York Moors village of Staithes. Grimes Nook is a lower ground floor apartment in the seaside village of Staithes. This apartment sleeps two people in one double bedroom and also has a shower room and an open plan living area with kitchenette, dining area and sitting area with woodburning stove. Outside there is a small front sitting area with bench and parking is in a nearby car park. Grimes Nook is an ideal romantic retreat in a lovely area, with the North York Moors, Whitby and Scarborough all well worth exploring. Amenities: Electric panel heaters with woodburning stove. Electric oven and hob, microwave, fridge, dishwasher, TV with Freeview, DVD, CD/radio, selection of books, games and DVDs. Fuel, power and starter pack for woodburning stove inc. in rent. Bed linen and towels inc. in rent. Pay and display car parks available in the top part of the village, charges apply at certain times of the year. Loading/unloading area approx. 100 yards from cottage - no parking at the bottom of Staithes village. Front patio with bench. Two well-behaved dogs welcome. Sorry, no smoking. Shops, pubs and beach 2 mins walk. Note: This property is accessed via a short flight of steps. Note: Mobile phone reception is limited in Staithes. Note: Parking and stairs may mean cottage is unsuitable for the less mobile. Note: Check-in 4pm. Note: No children, including infants. Town: The seaside village of Staithes offers cobbled streets and back alleys, pretty houses, harbour, sandy beach, pubs, shops and tea rooms. The Cleveland Way is well worth exploring, whilst the larger resports of Whitby and Scarborough are nearby. Electric panel heaters with woodburning stove. Electric oven and hob, microwave, fridge, dishwasher, TV with Freeview, DVD, CD/radio, selection of books, games and DVDs. Fuel, power and starter pack for woodburning stove inc. in rent. Bed linen and towels inc. in rent. Pay and display car parks available in the top part of the village, charges apply at certain times of the year. Loading/unloading area approx. 100 yards from cottage - no parking at the bottom of Staithes village. Front patio with bench. Two well-behaved dogs welcome. Sorry, no smoking. Shops, pubs and beach 2 mins walk. Note: This property is accessed via a short flight of steps. Note: Mobile phone reception is limited in Staithes. Note: Parking and stairs may mean cottage is unsuitable for the less mobile. Note: Check-in 4pm. Note: No children, including infants. We had a lovely stay at Grimes Nook, the accommodation was great, clean & tidy & well equipped. A relaxing break from the hustle & bustle of everyday life, no wifi or phone signal.